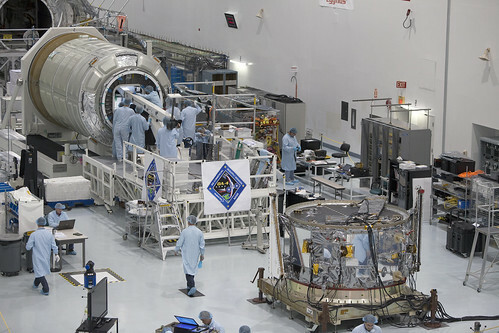 In the International Space Station Processing Facility at the Kennedy Space Center in Florida, engineers and technicians load equipment aboard an Orbital ATK Cygnus spacecraft. The fourth commercial resupply services mission will be the first flight of the enhanced variant of the Cygnus advanced maneuvering spacecraft, capable of delivering more than 7,700 pounds of essential crew supplies, equipment and scientific experiments to the station. Liftoff currently is targeted for Dec. 3, 2015 during a 30-minute window that opens at approximately 6 p.m. EST. The Cygnus will launch atop a United Launch Alliance Atlas V rocket from Space Launch Complex 41 at Cape Canaveral Air Force Station, Florida.